When I hear "We should have this more often" I know I've hit on a winner. And, that's exactly what I heard last night. Of course, it could be that it took forever to take photos, as I searched for the camera, tripod, attachments, and remote, no two of which could have hidden in the same place. So, either this is absolutely delicious (even cold), or it tastes great if you have your family smell the lemony goodness for a full 15 minutes before you let them dig in. Personally, I think it's good either way. Directions: Mix the flour, Parmesan, salt and pepper in a dish or pie pan. Dredge the chicken breasts in the flour mixture, patting the flour to make sure it adheres to the chicken. Heat 1 tsp of the butter and the olive oil in a cast iron skillet set over medium heat. Add the chicken to the pan and cook until the outside is brown and the chicken is cooked through, about 2 to 3 minutes per side. Remove the chicken to a plate and cover to keep warm. Add the remaining 1 tsp of butter to the skillet, along with the lemon juice, wine or stock, and capers. Simmer for a minute or two, until the sauce reduces by half, then add the parsley. Serve the chicken by dishing up one chicken breast piece onto each plate and pouring 1/4 of the sauce over the top. This recipe easily doubles, so that the pieces can be served on a larger plate pouring the sauce over all, and passing the dish. Stealthy Cooking Tip: Julia Child was right - butter tastes wonderful! It's how much butter we consume and how often that can tip the saturated fat scale into the unhealthy range. 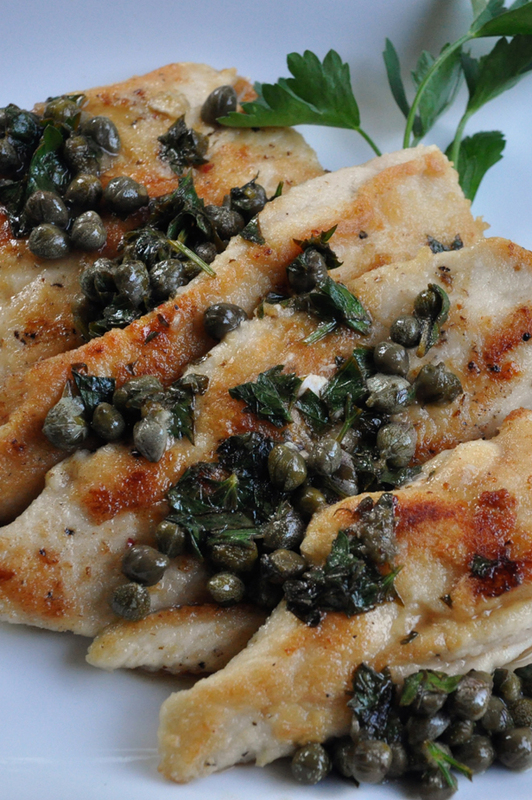 Traditional piccata recipes use 1/2 cup butter to cook the meat, plus more for the sauce. This recipe uses 2 teaspoons of butter for four servings, not a lot per person, but that rich buttery taste still comes through. Reducing the amount of butter you use, as well as replacing some butter with olive oil, helps reduce the amount of unhealthy saturated fats, while increasing the amount of beneficial fats. 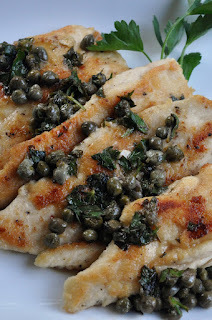 I can't say not to lemony flavor and the cheese inside this delicious chicken piccata. Its something new for me because I am more into Asian cooking. Will be a good try for a change and the next round when chicken is to our meal.